This gown could be yours! Hello girls! Boy do we have an awesome surprise for you. Are you getting married? No budget for a wedding gown? Are you rebellious enough to wear a gown that's traveled all the way from Canada courtesy of a fellow RB reader FOR FREE? Then this blog entry is for you! Let's be honest, the wedding world is kind of a bully. The minute you get engaged you're expected to fit a mold and most of the time, it's a mold of a princess. So much for pressure, huh? I thought I was marrying one person. Turns out, I was marrying 200. To make matters worse, months after we got engaged, the Royal Couple (Yes, that's you, Will and Kate!) tied the knot. And suddenly the princess phenomenon was really on. I have committed the cardinal sin of wedding preparations: I tried being someone I'm not. I succumbed to the princess pressure and bought a wedding dress fit for one. But RB readers, I'm no princess. I can't get through a day without falling and slipping. I have the laughter someone once described as "sounds like you're having an asthma attack". I think 'dork' is a more apt title for me. This is what would have been my wedding dress a.k.a. probably one of the most beautiful things I ever laid eyes on. It's ivory. 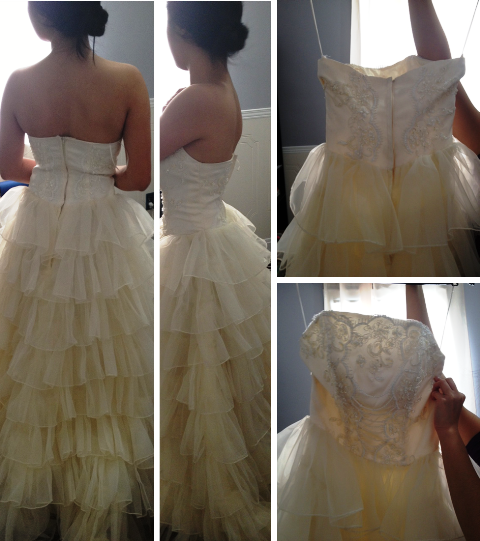 The top part is made of silk with white beading and the bottom consists layers of organza. It measures 52 inches in length (from chest to end of the dress), 33-35 inches for bust, 24-26 inches for the waist AND, I'm giving it away for FREE. That's right, free. This gown in all its beauty and elegance deserves someone who possesses the same qualities. Maybe it's you? Oh and before we forget, this gown is technically brand new. Christia will not be wearing this to her wedding. She decided to get another one that's more fitting to her personality. In other words, nagpakatotoo na siya! Wow... Such a Nice Gown.